Did you know that toothpaste contains numerous chemicals? Brighten up your smile without the dangerous ingredients by making your own tooth powder at home with simple items you might already have around your house. Tomatoes are a rich source of lycopene, an antioxidant which can help prevent osteoporosis, heart disease, and even certain types of cancer. Tomatoes also contain a good amount of Vitamin C, and less commonly known nutrients such as molybdenum, biotin, manganese, and copper. The phytonutrient content of tomatoes is outstanding, including flavonones, flavonols, carotenoids, and glycosides. These antioxidant nutrients protect the body from oxygen damage to fats, help enzymes function better, and lower oxidative stress in the body. There are hundreds of different types of tomatoes, so you have your choice when it comes to including them in your meals. From yellow to purple, and beefsteak to roma, the varieties of tomatoes each offer a slightly different nutrient profile. Mix it up and try a new tomato the next time you’re at a farmer’s market. This little pot of liquid gold has helped my skin more than anything else I’ve tried (except cutting back on sugar!). I soaked dried calendula flowers in avocado oil for a few weeks. Then, I added the following essential oils: frankincense, bergamot, lavender and tea tree. This blend of oils helps calm inflammation and redness, and also reduces acne and scarring. Broccoli is a nutrient-powerhouse that sometimes gets a bad rap for it’s sulfur smell. However, that sulfur helps our cardiovascular and central nervous systems run properly, among other things. Loaded with over 100% of your daily value for both Vitamins K and C, broccoli actually contains more Vitamin C than an orange. This cruciferous veggie has phytonutrients to help your body’s detoxification processes, and is also a powerful anti-inflammatory food. The vitamins, minerals and phytonutrients combined in broccoli work together to lower your body’s oxidative stress. Be sure to include this and other cruciferous veggies several times a week. It’s easy to roast a big pan of broccoli for dinner and then have leftovers for breakfast. I’ve been taking care of my skin naturally for years. And it’s much cheaper than you’d expect! Today I’m sharing my favorite natural skincare products which are easy to find and easy to use. The skincare and personal care products available to us have many chemicals which can cause adverse reactions and responses in the body. Although there are several truly natural skincare companies out there, I personally like to use a few inexpensive items for my basic daily care. See below for my top 5! Looking for an easy, yummy cookie to make? This recipe, inspired by Kristine In Between, is just the thing to try! What could be more perfect with afternoon tea? Enjoy!! Is your skincare routine safe? Do you know how many personal care products you use on a daily basis? The average is at least nine, but many people use more than 15 products per day. This means we’re exposed to around 100 chemicals each day, which are readily absorbed by our skin. An interesting fact about the personal products we use everyday is that the government doesn’t require any type of safety testing before the products are released to the public. This means long-term effects of the products are not studied or tested. There are known carcinogens and hormone disruptors still being used in products even though we know their dangers. There’s no way to tell if the product that gives your hair such volume now won’t also give you so much disease in the future. If you don’t think pudding for breakfast sounds like it fits the whole idea of eating healthy, real foods, you’re in for a surprise…and a treat!! Let us introduce you to chia seed pudding – packed with nutrition, this simple make-ahead breakfast from There’s a Cook in My Kitchen will have you wondering if it’s really OK to eat. Definitely, yes!! And the fact that you can make it the night before means that your start to the day will be healthy, delicious, and low-stress. Note: we recommend that you substitute stevia for the coconut sugar in order to keep the sugar content lower. 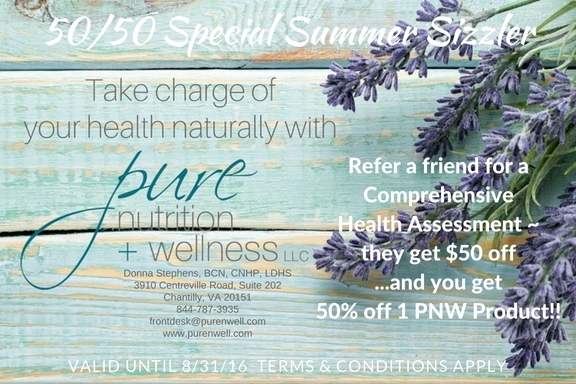 It’s already August, and the days are long and hot…so how about a cool offer from Pure Nutrition + Wellness to refresh and inspire you and a friend?!? Terms and Conditions: This offer must be mentioned when scheduling the Comprehensive Health Assessment and coupon must be presented at the time of appointment for the $50 off offer to be considered valid. Please call 844-787-3935 to schedule your Comprehensive Health Assessment, or contact us at frontdesk@purenwell.com. We look forward to seeing you soon!